If you’ve ever felt lazy for sitting down while you ride your bike, a new sub-compact bicycle will surely get your heart pumping even faster. 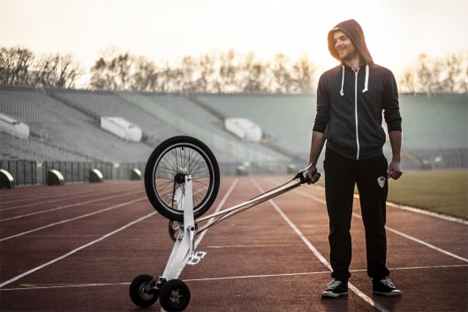 The Halfbike, created by Mihail Klenov and Martin Angelov, breaks a bicycle down into only its most essential parts and leaves you with…well, half a bike. You’ll find no seat or handlebars on the Halfbike. It’s rather more like a tricycle with a single central pole for balance, on which is mounted a single hand brake. The front wheel does the driving; steering is accomplished by leaning in the appropriate direction. Imagine an analog Segway and you’re halfway there. 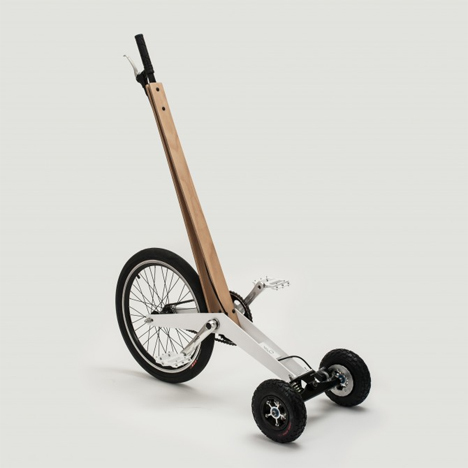 The Halfbike was designed for urban commuters who only have very short distances to travel – under 3 miles or so. It’s a quicker alternative to walking, and it’s tiny enough to get around even on the busiest of city streets. Since you’re standing while you pedal, we’d imagine it would provide a killer leg and glute workout. Weighing in at just 17 pounds, it’s also ultra-portable so you can take it up to the office with you and stash it in a closet until closing time. 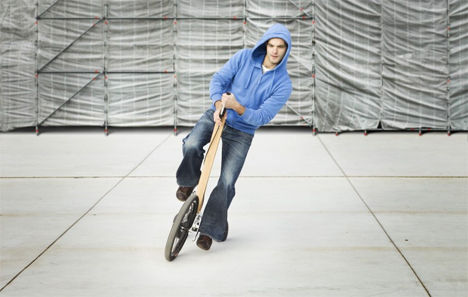 Prospective owners will have to keep in mind that the Halfbike truly is just for fun or commuting since you have to keep both hands on the central pole. You won’t be able to bring groceries home on it unless you’ve got a backpack, great balance, and not many groceries. The designers took their idea to Kickstarter to raise funds for the initial production run. They plan to sell the bikes for around $800 each.